Coursework writing is one of the fundamental constituents of the final grade in any subject. A student demonstrates understanding of the subject matter with proficiency in this manner. The level of fluency achieved in completing the coursework will determine the academic ranking of the student within the classroom. 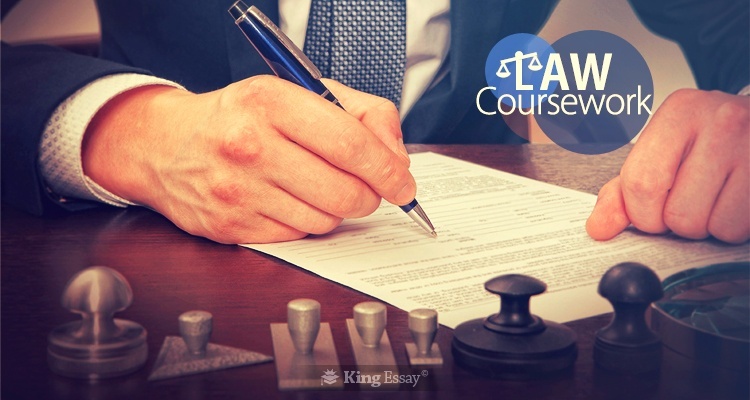 Coursework, in the subject of law, is designed to assess several different skills. Not all scholars find it easy to understand all the legal vocabulary and lexical terminology used in this subject. The problem is compounded when learners are given complicated situations and they must make very careful yet clearly deliberate judgments. This is one of the most difficult subjects to achieve a higher qualification in with learners facing extremely challenging circumstances to build a reputation in law. The language used in the law coursework needs to be precise, distinctly well-defined and straightforward. Avoid using words which have double meanings, or using flowery language which confuses the reader. Use simple sentence structure instead of complex sentence structure. In simple sentence structure the subject of the sentence comes first followed by the verb and the object being discussed. King Essay is a service for students to avail customized assistance with their law assignments or any other academic projects. The writing provided by our experts will always be guaranteed to contain zero plagiarism. Read the question carefully before jumping to conclusions as to what is the required course of action. Look for keywords such as critically analyse, compare, explain, define or evaluate when assessing how to answer the questions. Completing the law or business coursework verify that each paragraph clearly represents a specific topic without ambiguity. Make sure that you employ the appropriate referencing technique to ascertain that there is no plagiarism within the writing. The wordsmiths at King Essay deliver law coursework help with the most up to date contents, rules and regulations, laws and acts. We administer a money-back guarantee to deliver the law production to meet your deadline. All the personal information that is collected will remain completely confidential throughout the composition process. We administer round the clock customer support for the convenience of all students. Our experts will be more than pleased to comply with any custom requirements for the task. It is advisable to let us know detailed task requirements at the time of placing an order. This way, there will be no room for any misapprehension. Before delivering any academic law assignment or composition, King Essay employs the use of highly distinctive software to assure that it contains no plagiarism. We provide the complimentary authorship of a Title Page and a bibliography section with each undertaking for this very reason. The client is not charged in any way for the composition of the title page or the bibliography. We maintain the highest GCSE science coursework requirements with each task. A quality satisfaction guarantee is delivered with each law production. Users have the privilege of getting unlimited amendments or revisions free of cost if they are not satisfied with the final product. Each creation is inspected with highly customised software for any grammatical mistakes, spelling errors or plagiarism one last time. After which it is finally delivered exactly to meet the associated deadline for the project.